I first arrived in Munich at the end of September with two weeks of orientation before lectures began. The international student network, TUMi, hosted a number of events for newcomers, including a few hikes and a scavenger hunt. Unfortunately I could only get on the waiting list for two of the hikes, but I did manage to get onto (and come second in) the scavenger hunt. It wasn’t a patch on the UBES version though: look out for the amazing event your social secs will put on after Christmas! As TUMi didn’t have space for me on their hikes, I looked around for other hiking groups in the city. 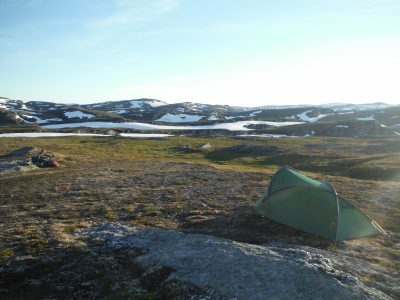 I came across the amazing Hiking Buddies group (website, Facebook). 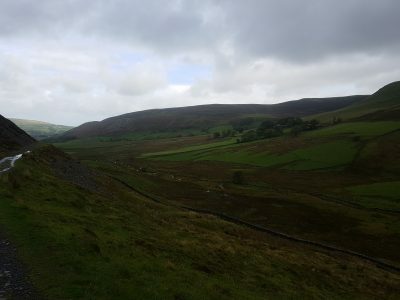 When I joined on Wednesday evening, I was expecting that I might find something for the weekend, but instead to my surprise there was a walk the following day! I registered at around 10pm, and by 8 a.m. the following morning I was standing on the platform with my new buddies. The mighty Zugspitze (2,962 m) is the highest mountain in Germany. We got great views of it from our hike to Hirschbichel (1,935 m). Leaving home at 7 a.m., the sun was just coming up. There was a heavy fog, and it was only 2º as I headed to the station. Two U-Bahns later, I arrived at the Hauptbahnhof (main station), where Thomas (the walk leader) and Katrin were waiting. After a few minutes, our other two companions showed up: Analia from Bolivia, and Irmilee from South Africa. An hour and a half later, the train pulled up at the tiny request stop of Untergrainau, and we headed off up the mountain. We were following a well-blazed path, and completed our 1200 m of ascent in under three hours. At the top, we took a summit selfie: a requirement of the Hiking Buddies trip system. Without a photo, the hike didn’t happen, and so you don’t get any points for the leaderboard! On the way back down, we stopped at the Stepbergalm, a mountain hut which was on its final week before closing for the winter. 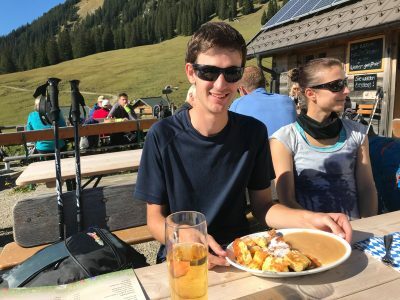 I was told that I “simply must try” the Kaiserschmarrn, a local dish as sweet as a dessert, but with a portion size large enough to serve as a main course. They were right: this plate of shredded pancake and apple mousse was an amazing introduction to Alpine cuisine. 1,200 m of ascent followed by equal descent counts as an easy hike. We need to update our definition of bimble. Signup ten hours before departure works just as well as ten days before. 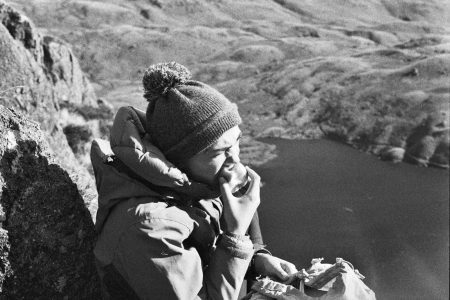 Lunch need not be strapped to your back: mountain huts are far more filling, and can provide beer too. Main course can be sweet. Leaving home before sunrise works well, and should occur on UBES weekend trips too. 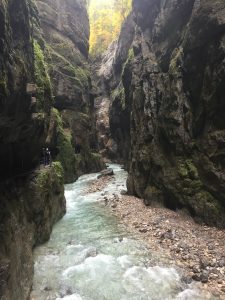 The following weekend, I was successful in getting a place on a TUMi hike, a trip to the Partnachklamm (Partnach Gorge). Again, we met at the Hauptbahnhof to catch an early train, but this time we were part of a group of thirty. The gorge itself was pretty, but very touristy, so there wasn’t much time to do anything but keep walking along the narrow path. Afterwards, we walked up the hill to have lunch, again at an Alpine hut, and returned through a little rain. Maybe this weather skewed my experience a little, but I’d definitely recommend the serious hiking group over the university’s welcome events. 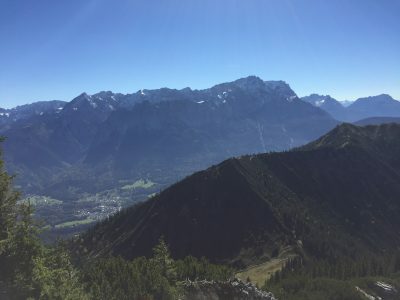 Since then, I’ve been on four other hikes with the Hiking Buddies, made some great friends, and really enjoyed exploring the Alps of both Bavaria and Tyrol in Austria. 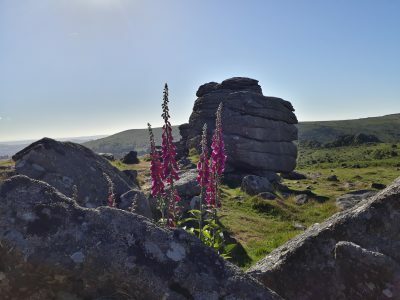 I’ve got a four-day hike coming up next week, as Thursday is a bank holiday, and I’m looking forward to many adventures to come. The snow’s starting to fall this weekend, and so my next post’s photos will look considerably whiter! If you’re planning a trip around here, and have any questions, send me a message on Facebook or by email.